I considered titling this post "Soovada Impressions" but then I thought I'd pick something that even the more casual reader would be able to make sense of. So Bioware applied a hotfix on Friday to make the game playable again, and it apparently consisted of reverting the group finder back to 8-man as the load from the 16-man queue was bringing the servers to their knees. O-kay, I don't even know what to say about that one. Guess I won't be writing about any adventures in 16-man group finder ops anytime soon, but I'm glad that I can actually play again. For the last couple of days, people on Twitter have been going on and on about how many hundreds of thousands of credits they've already spent on the casino event and it just boggles my mind because I don't really see the appeal. That wasn't going to stop me from checking it out however. You start out at the event terminal on the fleet with a little advert for your faction-specific casino, both of which I thought were quite cute. The Club Vertica twi'lek lady wears an interesting chest piece - at first I thought it was identical to the old consular War Hero chest, but it's actually lacking the little spikey things on the shoulders. I don't think it has the little flaps at the bottom either. The Star Cluster Casino advert on Imperial side just cracked me up with its blatant silliness. "Tired of living the life of a chump?" Come to the Star Cluster Casino and have scantily clad people of both sexes dance all around you! Also, my Aurebesh lessons have clearly paid off already: I admittedly didn't notice it while watching the adverts live, but when I looked at the screenshots I had taken afterwards, I immediately recognised that the text in the background was spelling out the name of the respective casino. Watching the adverts gives you a quest to go to Nar Shaddaa, but sadly there is no great reception or anything. 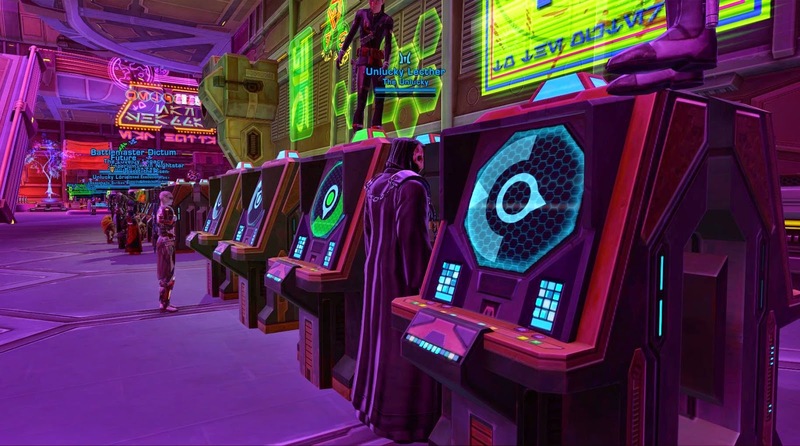 I was hoping there'd be a little cut scene of a casino employee welcoming you to the establishment or something, but it just pops up with the "mission complete" message and you get five free chips to play on the Smuggler's Luck machines. 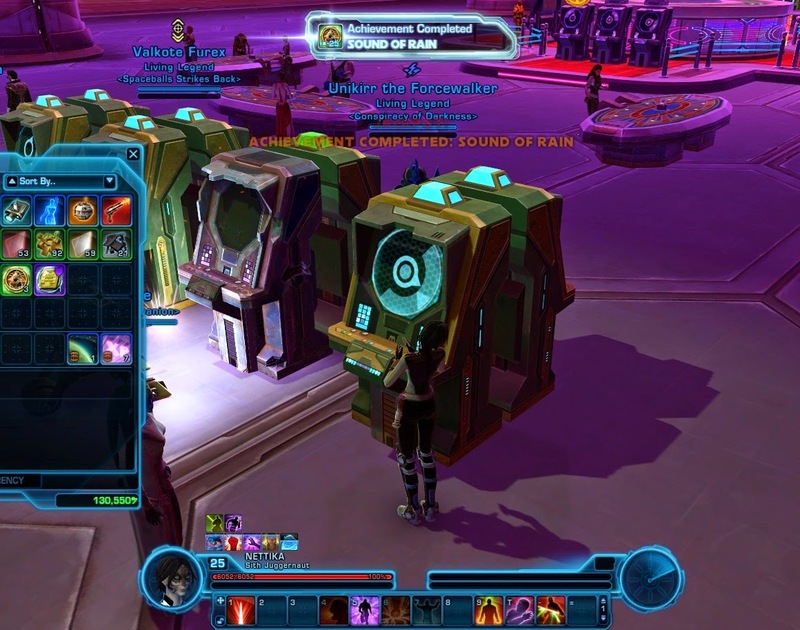 Now while I'm not a big fan of gambling, I rarely say no to free stuff, so I logged all fifteen of my eligible alts and took them to Nar Shaddaa just to collect their freebies. With all those free chips combined I was able to tick off several of the achievements already and won three Golden Certificates. I'm not sure what I'm going to do with them yet though. My level 25 Sith warrior wins a prize from her freebies and gets an achievement in the process. 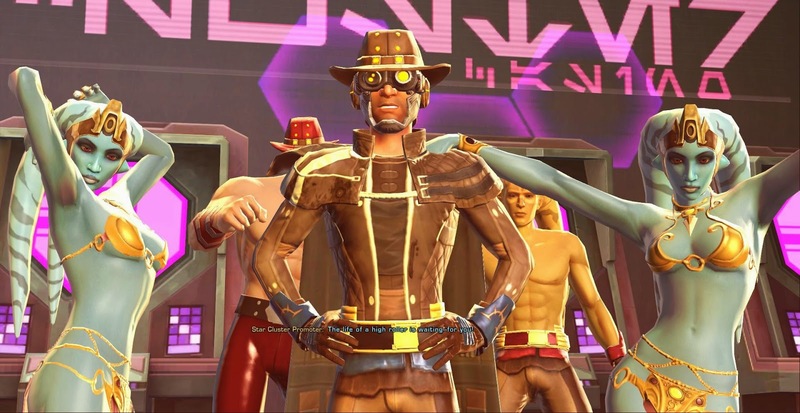 The event seemed reasonably popular from what I could tell, but I didn't see a lot of extra instances of Nar Shaddaa getting spawned. Then again, that might well still be a side-effect of people shunning the game afters the servers were going haywire for several days. They definitely shouldn't cram more people into the existing instances than they currently do, because then the limited amount of slot machines would become quite annoying - especially since everyone who tried the event on the PTS recommended that you should alternate between two machines at the same time to use your chips at maximum efficiency. The result of this was that I frequently had to "elbow my way in" to get access to even just one machine to get my handful of free plays off. The slots themselves are honestly pretty boring. There's the red circle to tell you that you've lost, and the green circle to tell you that you got your chip back... or two chips back... or won a prize. There are minor ways to differentiate between the different types of "wins" (I'm not sure I consider the machine spitting my chip back out a win really...), such as raid-warning type text popping up to say "Double chips!" or your character emoting, but it's honestly a bit hard to keep track of, so you just end up opening your inventory eventually and stare at your chip stack while you play to see whether it's growing or shrinking or some sort of prize shows up in your bags. I've heard some people say that it's a compelling way of passing the time if you're just logged into the game without doing much (and I know some people who do that) but personally I tend to find better things to do if I'm bored. Others will keep gambling away as much as it takes to get all the achievements. Me? I still don't know. 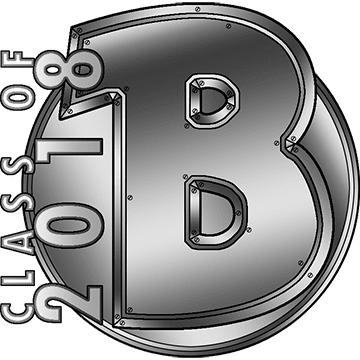 I maintain that it doesn't seem like a very interesting activity, but considering that the whole thing will be live until the end of summer, I can't exclude the possibility that I might decide at some point that one of the prizes interests me after all and I want to go for it. To end on a more positive note however, I just want to say that I do love the general idea of having a bigger variety of events, including something like this which is light on content but runs for a longer amount of time. Doing something with Nar Shaddaa also fits the lore/environment very well, even if I'm personally not exactly blown away by it. But anything's better than Life Day.